Very nice hand drawn visuals (especially the character portraits). Takes a while to feel the typical freemium grind. Dungeons are a decent change of pace. Excepting the combat, it's like almost any Kabam-made F2P town builder ever. Combat isn't particularly exciting, either. 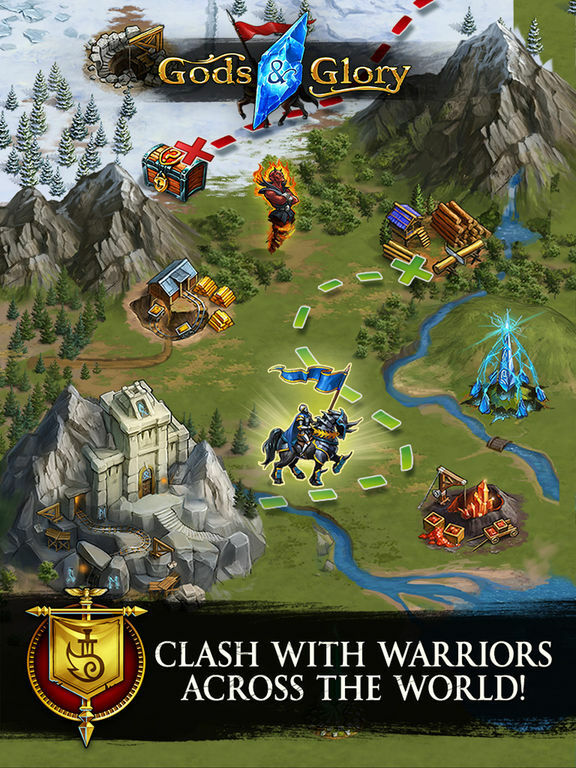 Gods and Glory: Age of Kings is a free-to-play strategy/town-building sim that, sadly, will feel pretty familiar to anyone who's played anything similar on mobile before. On the one hand, this means if you've played other games from the same genre you'll likely be able to tackle a lot of these tasks blindfolded. On the other hand, that familiarity can get your town up and running a bit faster. Getting started is pretty much just a matter of following the prompts, at least initially. Thankfully the training wheels come off fairly quickly, and then you're free to focus on your own expansion path. Within reason, of course. If you're unsure of what to do next, check out the info bar in the top-left. This will point you in a general direction, but you can deviate if that's what you'd prefer. Remember to collect your accelerations. Accelerations can be collected from the shop once every few minutes, and will allow you to cut down wait times significantly. These are a great alternative to using premium currency if you don't want to wait. Upgrade everything all the time. You're going to have way more resources than you need in the beginning (thousands, when you use less than a hundred per task). Put it all to good use by getting your structures as high a level as you can. Make use of the 5 minute rule. If something has less than 5 minutes of build time left, you can complete it instantly for free. This is a great way to trim down your overall upkeep time, so long as you leave the game running and watch for the timers. Combine accelerations with the 5 minute skip to really speed things up. Managing and growing your town is only half of the battle. The other half is, well, the battles. Assign units to protect your wall. It won't be long before your newbie insurance policy expires and you're left vulnerable to other players. In addition to upgrading said wall, you'll also want to make sure you have forces in place to help defend it. You can pick and choose from any units you have available (other than your hero), or you can automatically assign everyone if you don't feel like micro-managing. Typical video game placement rules apply. It's in your best interest to keep melee-focused characters in the front lines, and put ranges fighters in the back. Fight using your hero often. Unlike regular units, your hero gains experience through battle and can eventually start to unlock new skills as they improve. Revisit dungeons. The materials you'll earn by fighting enemies can be used to craft new gear for your hero and make them even more powerful. Gods and Glory: Age of Kings is a looker, and the familiarity might be a comfort to some, but it's also quite derivative. Whether or not that's a deal-breaker depends on how important the minor differences are, as well as your feelings towards by-the-numbers mobile F2P sims. Gods and Glory: Age of Kings has an impressively uneven start. It all begins with some random warrior (though extremely well-drawn and animated) telling you about how she needs help fighting the demon hordes. Then it's on to watching a bunch of fancy-looking characters fight some demons before finding yourself staring at the all too familiar sight of an isometric town building view. Oh, and there was something about how you're the best candidate to fix up and run the town. Despite nobody there knowing a single thing about you, you won't hesitate to take up arms against a demon or two. At Least it Looks Good? Before I get to the griping (and there's going to be a lot of it), I do have to give Gods and Glory credit where credit is due. The game looks pretty good. Character portraits are a big stand out, but the designs for the regular combat units are also enjoyable and there's a surprising amount of detail - moving detail, even - on several of the buildings you can put in your town. Good uses of color, too. It makes a lot of things 'pop,' visually speaking. I also have to say that, unlike a good number of other freemium sims, here you can get a good deal accomplished before the typical grind (i.e. waiting for everything) starts to set in. There is, of course, a process to it all. You have to upgrade building A in order to improve building B, which then lets you upgrade building C and so on. However, it moves along fairly quickly in the early stages as you'll be earning resources almost as fast (and in some cases faster) than you can spend them. Combine that with being able to instantly finish any construction project that has 5 minutes or less left on it (premium currency is required for anything over 5 minutes, though) and you've got a pretty accessible introduction. Well, accessible in terms of freemium sims with ugly, crowded menus, anyway. I made it about two tutorial tasks into Gods and Glory before I started getting a very specific sense of deja-vu. 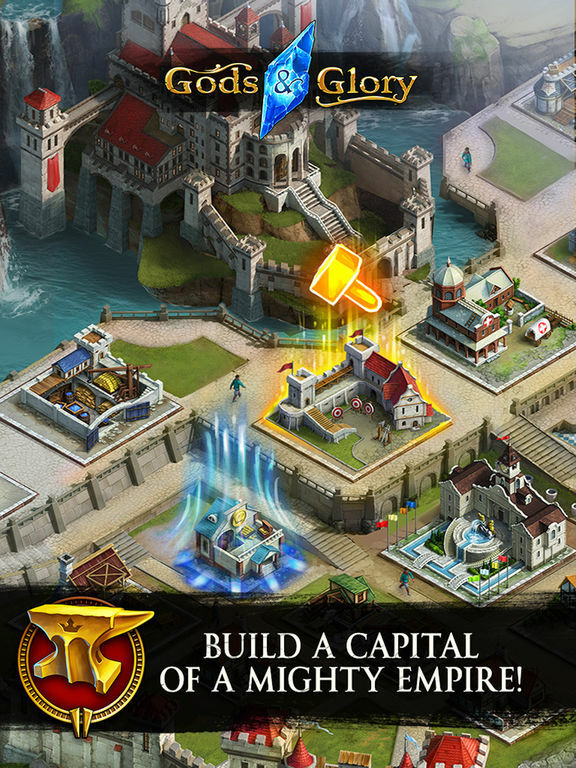 Granted, I've played a lot of free-to-play town builders on mobile over the years, but this was different. It felt like I'd played this before. I mean this exact game, not simply something like it. 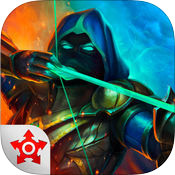 The general presentation, the menu structure, the unit construction, the early stages of town building - it all feels a little too much like several of the old Kabam F2P sims I've reviewed years ago. There are definitely some differences, don't get me wrong. The combat, while being pretty much entirely hands-off and kind of uninteresting, is certainly not the same. Nor is the inclusion of dungeons, which is sort of a misleading term as all you do is send a team in and fight enemies rather than explore anything, but it's still something you can do that isn't raiding nearby NPC or player settlements so I'll take it. Gods and Glory: Age of Kings is ultimately an okay free-to-play town building and strategy sim, but aside from the visuals and a few (honestly inconsequential) adjustments it's just like most other okay free-to-play town building strategy sims you can play - and probably already have played. If you've never dabbled in the genre, it's as good a place as any to start. If you're already familiar with this kind of stuff, there's really not much reason to bother.